When you think of Spain, Barcelona’s glittering Gaudi architecture and sunshine-filled beaches may first come to mind, but the country has another secret cultural haven: Madrid. 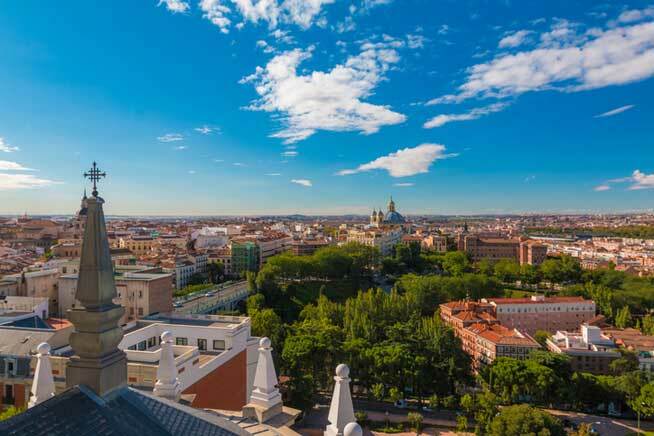 An authentic Spanish paradise filled with gastronomic delights, neo-classical architecture and some of the world’s best art, Madrid is the city to visit if you want to experience the real Spain. Besides special art exhibits and the more famous art museums such as the Prado, there are plenty of smaller museums worth a visit too. In fact, many of Madrid’s lesser-known museums will offer free entrance Saturdays after 2 p.m. and Sunday mornings. Some of these include the recently renovated MAN (Museo Arqueológico Nacional) which has a section dedicated to the prehistoric Altamira caves, the Sorolla Museum, dedicated to the life and works of artist Joaquín Sorolla (don’t miss the charming courtyard gardens here) and the Museo Cerralbo, a former palace which allows us regular people to see how Spain’s royalty and elite once lived. If you want to get down to the nitty-gritty of the art culture in Madrid, for just $7.40, you can participate in a street art tour from Street Art Madrid. Taking you through the funky, ethnic neighborhood of Lavapiés on what they call an “urban safari”, you’ll get to discover a whole new style of Spanish art. Weekday mornings are for exercise in the park. You could visit the most famous and central park in Madrid, the Retiro, or you could head to some of the lesser-trodden spots, like the Parque Europa. Located just outside of Madrid in a suburb called Torrejon, this quirky park has replicas of 18 monuments in Europe, so you can check out the Tower Bridge, Eiffel Tower, Trevi fountain and more without ever leaving Spain. If you’d prefer something a little more natural, the Casa de Campo park is actually the largest in Madrid, a whopping five times larger than New York’s Central park. Featuring endless biking and walking trails and an enormous lake, it’s also the site of Madrid’s zoo and cable car, which you can ride back to the edge of the city centre. As in any large city, you can dine and shop in Madrid to your heart’s content. But the city has a few one-of-a-kind shopping and dining adventures that shouldn’t be missed. Besides the typical shops and restaurants you’ll encounter on every corner, make sure to check out the Mercado de Motores (one weekend per month) to find vintage treasures like antique furniture, retro electronics and cool clothes. The MadrEAT food festival (one weekend per month) lets you sample Korean bao, Spanish cheeses, Venzeulan arepas and more from the 50+ participating food trucks.